Conduct a flight from New Cuyama Airport (L88) to San Luis County Regional Airport (KSBP) without any en-route air traffic control services. Become familiar with radio communications at non-towered airports. Become familiar with radio communications when arriving at a Class D airport. Become familiar with operating requirements within Class D airspace. Demonstrate basic VFR navigation skills. Fly from L88 to KSBP without utilizing any en-route ATC services. Inform ATC on initial contact into KSBP that you are performing the CAT-2 Rating. Provide an accurate position report on initial contact. Meet the standards listed here. Note: if you would like the flight to be logged in peaware you should file a VFR flight plan from L88 to KSBP prior to starting the flight. The L88 airport is located within Class G airspace which doesn’t generally impose any requirements on our flight. En-route between L88 and KSBP you will once again generally be operating in Class E airspace which also doesn’t generally impose any requirements on our flight. KSBP is located within Class D Airspace. Class D airspace exists around most airports with an operational control tower. 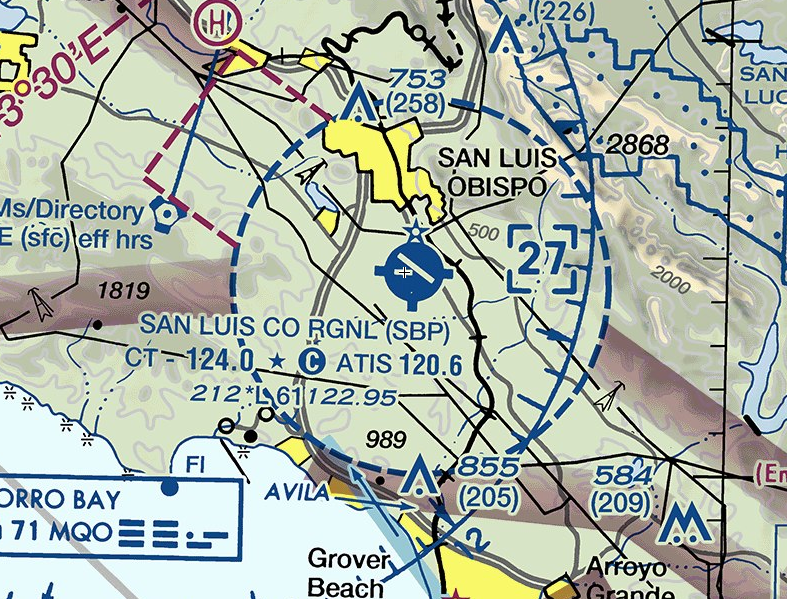 Generally Class D airspace extends from the surface to 2500’ AGL and exists within 3-10 NM of the airport. 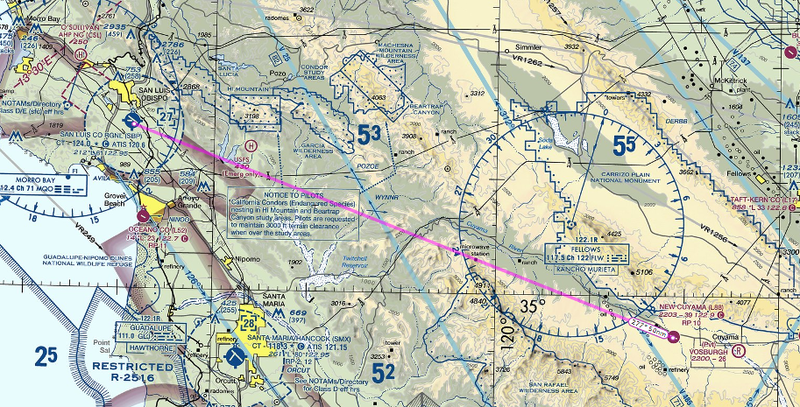 On VFR charts Class D airspace is depicted within a dashed blue line. Within the dashed blue line the maximum altitude of the airspace is depicted in a broken box in hundreds of feet. The minimum altitude of Class D airspace is always the surface. Around KSBP the Class D airspace extends out 4 NM from the airport and goes from the surface to 2700’ MSL. Prior to entering Class D airspace federal regulations require that pilot’s establish two way radio communication with the tower. The Aeronautical Information Manual recommends doing this no more than 15nm from the field. Be sure to listen on the frequency prior to transmitting to ensure you do not interrupt an existing transaction. In order to establish two way radio communications the pilot must call the tower and the tower must reply using the aircraft’s callsign. As odd as it might seem, the control tower has used your callsign, so you have established two way radio communication and may enter Class D airspace. Then you have NOT established two way radio communication and may not enter the airspace. Controllers are well aware of this distinction and may intentionally use one versus the other, so be sure to listen closely to their response. Most control towers also provide ATIS (Automated Terminal Information Service). ATIS is a recorded broadcast which continually transmits weather, NOTAMs and runway information. Pilot’s should listen to the ATIS broadcast prior to contacting the control tower. Each ATIS has a unique letter identifier which should be relayed to the tower on initial contact. Frequencies to listen to ATIS are available on VFR charts and in the Airport Facility Directory. Include your callsign in all transmission to Air Traffic Control. Read back all ATC communications to ensure you properly understand the clearance. Avoid making extra transmissions which are not required or requested by ATC. Normally the tower will reply with a runway assignment, pattern entry instructions, and in some cases a reporting point. As with all Air Traffic Control Communications you should comply with the instruction and advise the tower when 2 miles from the airport on a right base. You can keep this instruction short and to the point. At this time the tower is likely to issue a landing clearance. After landing exit the runway at the first available taxiway and ensure that the aircraft is past the hold short lines. The tower should either provide taxi instructions or tell you to contact ground control. Do NOT switch to ground control without an instruction to do so. If you have cleared the runway and the tower doesn’t call you with instructions query the tower. When contacting ground the same transmission format can be used as when making initial contact with the tower, however it is not necessary to repeat the ATIS code. Prior to taxi-out from New Cuyama. When 10 miles away from San Luis and after obtaining the ATIS. When on a 2 mile right base. N123AB: “Cessna 123AB, 2 mile right base.”. ASF presentation on non-towered operations, covering closed traffic, departures, arrivals and radio calls. Highly recommended. FAA publication on basic and advanced VFR navigation skills. YouTube recording of a live workshop conducted by PilotEdge covering VFR flight planning and navigation methods.